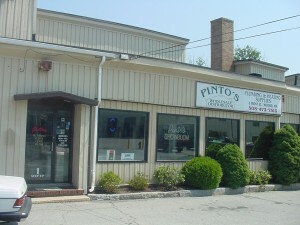 About Us « Pinto’s Plumbing & Heating Supply, Inc.
was founded in 1976 by Bento Pinto in Milford, Massachusetts. It is a family run business with his nephew, Mike, the key go-to person for what you need. Pinto’s stocks unique parts representing plumbing, air conditioning and heating equipment, tools, and fittings of all kinds. Pinto’s stocks hydronic heating equipment in both gas & oil for residential and commercial applications. Pinto’s stocks plumbing appliances like faucets, sinks, toilets, tubs and shower units in the newest designs and the traditional builder grade units. Our product offerings are used in everything from small residential remodeling jobs to new construction, commercial projects, local town housing authorities, and businesses. When you need something that isn’t readily available on our shelves, Mike or Benny will find it! Our extensive network can supply an order through one source.